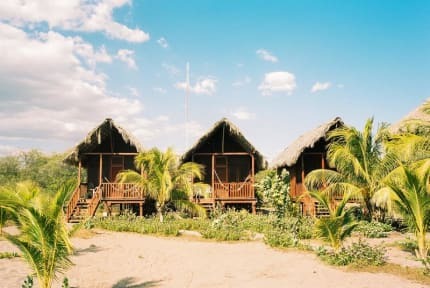 Surfing Turtle Lodge, Las Penitas, Nikaragua : Rezerwuj teraz! Surfing Turtle is a lively, fun and social beachfront hostel located on a beautiful stretch of empty beaches in Isla Los Brasiles, at Northern Nicaragua’s Pacific Coast, Central America. It is a 20 minute drive from the historic city of Leon, a short boat ride and horse cart ride on the island. Also, we explore travel with an off the grid approach, powered with solar panels, an onsite turtle hatchery, and growing some of our own food. The Lodge provides all the necessary amenities, such as restaurant, stocked bar, private rooms, dorms and more. Also, activities such as surfboard rentals, horseback riding, yoga and more is available. The Lodge is located on a remote stretch of beach along the Pacific Coast. The beach is virtual deserted with nice waves and beautiful sunsets. Along the back of the property is an estuary with various wild life. In addition, we are neat to some of the best attractions of the area such as Reserva Natural Isla Juan Venado and Reserva Natural Complejo Volcánico Telica Rota, amongst other important spots of our city. The rooms have comfortable double beds or bunk beds in the dorms. They have fans for air circulation and mesh on the windows. Also, they are located in various áreas of the property. In addition, we have several common areas where the guests can get together and exchange past experiences and future plans. Breakfast not included. It goes from 3.00 USD to 6.50 USD per person per day.